The Robert Shaw and Alice Parker arrangements of American (chiefly Appalachian) folk tunes are legendary. This 1967 setting by Alice Parker is an especially effective companion piece to the Credo of the Bluegrass Mass in tonight’s program. How can a mostly improvisational musical genre that still proudly bears its rustic, untrained-musician credentials blend with a sophisticated musical form heard almost exclusively in concert halls and large churches? That was the challenge faced by the two creative artists commissioned by acclaimed Minneapolis choral ensemble VocalEssence–to compose a bluegrass mass. Poet Marisha Chamberlain and composer Carol Barnett were also joined in that commission by Monroe Crossing, whom we are fortunate to have performing with us tonight–as they have joined choruses across the country in over thirty other performances of The World Beloved. Librettist Marisha Chamberlain is a multi-genre writer. Her debut novel, The Rose Variations, was published by Soho Press in 2009 and received a rave review in the New York Times Book Review. Her stage play, Scheherazade, won the Dramatists Guild/CBS National Award, and her screenplay version appeared on public television across the country as well as at the British Film Festival in the category of Best of American Public Television. Her plays have been staged all over the world and are available through Playscripts, Inc. She has been awarded fellowships by the National Endowment for the Arts, the Rockefeller Foundation, the Bush Foundation, the Jerome Foundation, and the McKnight Foundation. She has been artist in residence at the MacDowell Colony, the Anderson Center, and the Rockefeller Retreat Center in Bellagio, Italy. Prior to her collaboration with Carol Barnett on The World Beloved the two creative artists had combined forces on a 1997 chamber opera, Meeting at Seneca Falls, premiered by the Minnesota Orchestra. Composer Carol Barnett has won numerous accolades, including commissions by the Saint Paul Chamber Orchestra, the Harvard Glee Club, the Minnesota Music Teachers Association, and the Children’s Theatre of Minneapolis, along with grants from numerous prominent foundations. Others of her choral compositions are published by top-drawer houses such as Oxford University Press. She is a charter member of the American Composers Forum and a graduate of the University of Minnesota, where she studied composition with Dominick Argento and Paul Fetler. From 1991 to 2001 she served as composer-in-residence with the Dale Warland Singers. As Marisha worked on the libretto, Carol started learning about bluegrass. . . . She attended several Monroe Crossing concerts and delved deep into a collection of CDs supplied by [commissioning benefactor Mike] McCarthy–mostly Seldom Scene, Bill Monroe, and Earl Scruggs. Even from its first performance in 2007 this extraordinary “crossover” work took the choral world by storm. (The CD recording of the premiere by VocalEssence included soprano chorus member and Griffin native Sally Jacob Messner.) It has been performed at Carnegie Hall three times (twice with Monroe Crossing and once with Dailey and Vincent) and has been sung by numerous college, community, and professional choruses and large church choirs across North America. To bring the solemnity of the classical-based Mass together with the down-home sparkle of bluegrass–now there’s an assignment. My highest hope is that listeners coming from one tradition–classical or bluegrass–and perhaps dubious about the other, might discover something new and wonderful in the combination, as I have. Composing the music for The World Beloved has given me the chance to write cheery sacred music–all too rare in a medium rife with staid and even lugubrious settings. It’s brought me back to memories of music heard while visiting my grandparents: country music with a church flavor that told stories and came out of a scratchy old record player. Grandma would not have allowed dancing, but under the table I tapped my toes. If you Google the term Bluegrass Mass, you’ll get Websites for several churches across the country who add Bluegrass music to enliven their worship services. Great Bluegrass music is infectious and lively, so it’s easy to see why any church would want to add Bluegrass, but why call it a Bluegrass Mass unless there’s liturgy, too–a text in the Bluegrass tradition? 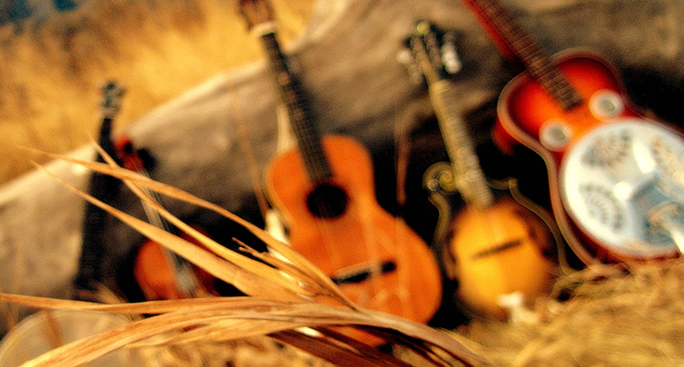 Bluegrass is more than a sound. The lyrics of so many Bluegrass songs display an unpretentious, earthy philosophy that is easy to sing and easy to understand: Adam lives just up the street and Eve’s the girl next door. Love is the major theme–frustrated yearning love, secret satisfied love, or boldly proclaimed love. And although love between two people is huge in Bluegrass, so is love of God, the Gospel tradition. Most of us have some familiarity with bluegrass, but the concept of the Mass may need explanation. The term “mass” derives from the root word meaning “meal” (as in the term “mess hall”). The “Meal” involved is Holy Communion–in various interpretations a “recreation” of the Last Supper hosted by Jesus in the Gospel accounts of the week leading up to his death and resurrection. For all Christians, the Communion is (as the name implies) a communal experience of the presence of Christ among them (though denominations differ in their understandings of the “form” Christ’s presence takes, and not all Christian denominations use the term Mass to describe the service). Because of the solemnity and importance of the Last Supper, from its earliest years the Mass took on a formalized, repetitive structure, containing many of the same components. With the addition of music starting with Gregorian chant in perhaps the 7th century and polyphonic (multi-part) singing in the early 14th century, the Mass began evolving as an important type of musical structure alongside other long forms like the oratorio and choral symphony. Perhaps as early as the 11th century the elements began to coalesce into what by the 16th century became identified as the Ordinary of the Mass–those elements which were to occur in every Mass as well as in their particular order: the Kyrie, the Gloria, the Credo, the Sanctus (sometimes subdivided into Sanctus and Benedictus) and the Agnus Dei. The World Beloved begins and ends with nearly identical opening and closing solos. In the premiere performance the opening soprano solo was sung by Monroe Crossing fiddle player Lisa Fuglie, and she reprises that performance tonight. The opening Refrain sounds simple and folksy, but that impression is disarmingly understated. In important ways, the two opening notes–and the words sung over those notes–tell us almost everything we need to know about the meanings to develop throughout the work. These notes are the D above middle C rising to the B above, an interval of a sixth, one of the more “dramatic” intervals, especially when ascending. (In the pentatonic [five-tone] scale common in Bluegrass sound, this tone separation is as wide as possible.) The sixth is a pivotal interval in that if that tone is “flatted” it is called a minor sixth, lending a “darker” minor-key sound to the music. But Barnett’s interval is the major sixth, whose “brightness” implies a more “optimistic” outlook. In bluegrass music in particular, the notes D and B are unique banjo-tuning pitches, thus hinting at the unmistakable bluegrass-band sound soon to follow. The major sixth is also important to musical ear-training, often remembered as the two opening notes of “My Bonnie Lies Over the Ocean”–also a folk tune. The interval of the sixth re-appears very soon in the Kyrie movement in the rhythmic bass chords (also using other wide, open intervals like fifths and sevenths), quickly illustrating how important the opening two-note motif of the rising sixth will be throughout the entire Mass to follow. But this opening motif of the rising sixth is also important to the text sung over those notes: “They say.” These two innocent-seeming words will put the rest of the text into important perspective. As librettist Marisha Chamberlain points out, the “they say” formulation is characteristic of the folk ballad form. The original bluegrass musicians might have known these “They” as their preachers, landowners, bank loan officers, mine owners, or other “city folk” who were “The Establishment” in authority over them. Yet perhaps the most important possibility for identifying the “They” is to see it as a statement about the limitations of human knowledge. “They” sounds like it means an identifiable somebody, but it may mean nobody in particular. The musical genius of setting these particular words is also expressed in the rhythm of the opening two-note motif. The second note is a dotted quarter note, held a long time relative to the first note and to the notes that follow. This “dwelling a while” on the dotted-half note emphasizes the word “say.” The wideness of the “gap” of the major sixth interval reminds us about the inadequacy of human knowledge of the Divine. But the word conveyed over that attention-getting “gap” prepares us to listen all the more closely to what Chamberlain and Barnett will have to “say” to us about the belovedness of the created world. Classical-music Kyries sometimes sound serene and beautiful. Not so this confession, which Barnett indicates should be sung as “intense.” The pleas for mercy–blending both ancient Greek and modern English words–are even anguished in their vocal difficulty, often employing dissonant chords and extreme vocal-range-stretching. Lisa Fuglie also sings this gentle solo, with its simple, buckboard-trot accompaniment. This representation of the biblical Eve as an innocent child is a far cry from the “downfall-of-mankind” villainess she becomes in other less-loving interpretations. This is the first of many “wide intervals” in the mass between a stereotype and a fresh view of a more down-to-earth human reality. This foot-stompin’ hoedown bursts at its seams with the energy of the Creation it praises. The “distance” of the opening motif of the sixth manifests itself here in the wonderful poetry of the text, in which creatures are represented by the poetic device of synecdoche–a part of a whole indirectly representing the whole itself: “feather” for bird, “scale and fin” for fish, etc. As soprano, altos, and tenors sing “Glory be for peace on earth,” the basses add an underlying counterpoint of the familiar doxology “Praise God from whom all blessings flow“ (Old Hundredth), and the band later picks up that tune again at the end of the verse. This verse is scored for soprano and alto soloists, beginning here again with fiddler Lisa, who is later joined by the soprano when the refrain motif returns, the two voices singing in close “country harmony” (including harmonies using the motivic sixth). The fact that the opening refrain returns at this duet of female voices indicates an important turn in the sung narrative, anticipating a significance revealed at the end of the Mass. The Credo is the Creed: the statement of belief spoken by the congregation in liturgical Christian churches. Rather than the expected statements about the Unity of the Three Persons of the Trinity, Marisha Chamberlain’s text and Carol Barnett’s music sing of simple human hope and trust. The opening motif of the sixth re-appears importantly, at the beginning of the powerful “row on” statement–at first descending but immediately re-ascending, suggesting the determined effort at dipping the oars in rowing across the River Jordan. The reassurance that “no one goes alone” on that journey is both highly moving and perhaps surprising. The traditional hope is that Christ goes with us at death. Yet the ambiguity of the phrasing in the context of the communal nature of the Mass suggests that we can help accompany each other on all life’s journeys, perhaps even the final one. Marisha Chamberlain reports having had her “wrists slapped” by conservative Christian reviewers for “failing” to mention the Trinity in specific terms. But such criticism misses the point. Chamberlain’s intent is to “emphasize the notion that we are all in this together.” This is indeed Trinitarian in the deepest sense. Inter-relationship may be the essence not only of Creation but also of the Creator. The chorus begins with a version of an element often included in other musical forms of the Mass, particularly the Requiem Mass: the Dies Irae (Day of Wrath and Judgment). Relief enters in the form of a tenor solo, at first suggesting the voice of Jesus. But so deep is the “mystery” of the Incarnation that the voice initially appearing to be Jesus almost immediately takes other “shapes”: first a solo soprano but eventually the full chorus (both male and female voices). The Agnus Dei is also sung only in Latin, this time by unaccompanied voices, often divided into seven parts and (as in the Kyrie movement early in the Mass) reaching to the extremes of the voice ranges. As Carol Barnett puts it, “Like the Kyrie, the Agnus Dei is a cry for mercy, [these two movements being] the emotional bookends of the work.” The absence of Bluegrass sound in this seemingly “classical” movement all the more effectively sets up the return to humble folksiness when the instruments take over in the movement to follow. The band plays a setting of the popular 19th-century hymn whose words begin “Art thou weary, art thou languid, art thou sore distressed? / ‘Come to me,’ saith One, ‘and, coming, be at rest.’” Rather than the familiar hymn tune, the band plays an original country waltz, a quiet entertainment providing brief respite from that weariness and sore distress. The absence of human voices in this movement again reflects a hesitancy at presuming to speak of things that humans can never fully understand–a sense that human words cannot provide the consolation that God (and, perhaps, wordless music) can. Traditionally, the Benedictus is often blended into the Sanctus, but Chamberlain concludes the Mass text with a freestanding Benediction. The words are those of Christ, but here again this “voice” is divided into many, both homophonically and in increasing complexity and variety of vocal counterpoint (semi-canon, antiphony, fugue), although the ending returns to greater simplicity and quietness of vocal texture. This complexity is all the more remarkably “disguised” by the overall impression of simplicity in the return of the gentle buckboard-trot rhythm. I believe women and men to be naturally equal and so it was natural to refer to God with the female pronoun at the end of the piece–God, a mother who “cloaks Herself” in empathy and comes on down to care for the needy and the unruly. Many Christian women, hearing the piece, including Catholic nuns, have felt the gesture of inclusion to be profound. It’s not defiant in any way, it’s inclusive. In fact, I didn’t want to create a furor early on in the piece, or any distraction whatsoever from the very simple message [that] the incarnation occurred because our creator so loved us. I wanted the piece to be a celebration, not an argument, so I kept the quiet point of God–he and she–for the end. That goes with what I know of ballad tradition, too. Often, a story ballad will begin with a somewhat distanced third person telling, but as it builds, a central character may suddenly speak directly. Once that’s happened in my ballad, “Oh, I am here among you now, though I must walk unseen,” and once those lines are sung by both male and female soloists, all that’s left is to make the he/she explicit in the final chorus. Ultimately, as the author of its text suggests about its ending, this work is not a theological disputation. It is a Love Song, designed as an integral part of a larger musical Love Feast (a term sometimes used to translate “Eucharist,” a synonym for Mass). It is all the more fitting that Chamberlain’s messages about simplicity and humility are sung in Barnett’s affectionate tribute to the bluegrass idiom, a musical form with humble roots. Thus, finally, the important “They say” phrase may now also mean Chamberlain and Barnett, and that what they have “said” in and through The World Beloved is loving and grace-filled indeed. Composed by commission in 2010, this spritely, polyrhythmic work is fascinating in its own right but also serves as an effective companion piece to the Gloria movement of the Bluegrass Mass. The text is by New England poet Emily Dickinson (1830-1886). Rapidly-rising composer Kenney Potter is Director of Choral Activities and Music Education at Wingate University, near Charlotte, North Carolina. He is also the son-in-law of Gloria and C.E. (Chubby) Williams of Griffin. Notes and translations (except where otherwise attributed) by Bill Pasch © 2014, with thanks to Steve Mulder and especially to Carol Barnett and Marisha Chamberlain for their generous e-mail communication. 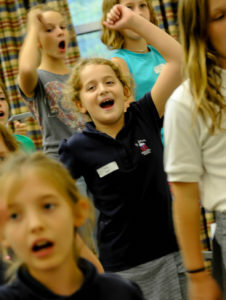 Griffin Choral Arts performs works under blanket performing rights license from ASCAP and from BMI. Named in honor of Bill Monroe, “The Father of Bluegrass Music,” widely acclaimed bluegrass band Monroe Crossing dazzles audiences with an electrifying blend of classic bluegrass, bluegrass gospel, and heartfelt originals. Their airtight harmonies, razor sharp arrangements, and on-stage rapport make them audience favorites across the United States and Canada. Among their many honors, Monroe Crossing was selected as showcase performing group at the 2007 International Bluegrass Music Association Convention and they were inducted into the Minnesota Music Hall of Fame in 2007. The only bluegrass band ever nominated as “Artist of the Year” by the Minnesota Music Academy (MMA), Monroe Crossing won the 2003 MMA “Bluegrass Album of the Year” award. The group also took home four awards — for Female Vocalist, Guitar, Mandolin and Banjo — at the Minnesota Bluegrass and Old-Time Music Association’s 25th Anniversary Awards Banquet. Monroe Crossing has recorded 13 CDs and one DVD to date. Their lucky 13th CD is “The Road Has No End,” showcasing both the band’s unique originality and its high regard for the classic bluegrass tradition.